Izannah Walker Chronicles: Who Is Izannah Walker? 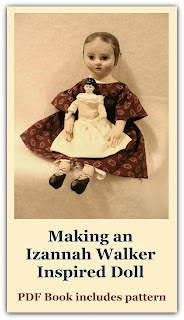 There are many images of Izannah Walker dolls in the backposts. This site was started in 2008 as a resource for those who love Izannah Walker’s work. I’ve been studying Izannah dolls since 2006, traveling as I can to document examples of Izannah Walker dolls. Permission is given for individual dollmakers to print and use images for personal study of Izannah’s dolls but not for commercial reproduction of images, derivative works or reposting on other sites. Read the article that Dixie Redmond and Edyth O'Neill on Iconic Izannah Walker Dolls, originally published in Early American Life. Izannah Frankford Walker lived in the nineteenth century, operating a cottage industry making pressed cloth dolls in a time when most women couldn't own property or vote. She first patented her dollmaking process in 1873, but she may have been making dolls as early as 1840. Her dolls have the look of primitive folk portraits from the mid 1800s. Born September 25th of 1817, orphaned at seven years old, Izannah and her sisters were raised by relatives in Somerset, Massachusetts, not far from her birthplace of Bristol, Rhode Island. 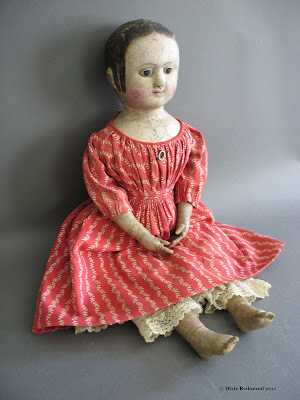 There is not much information about Izannah until later in life, when she is listed as a dollmaker living in Central Falls, Rhode Island as of 1865. In 1873 she applied for a patent for her particular process of making an unbreakable doll. Her early dolls resemble three dimensional folk art portraits of the 19th century. Later post-patent dolls with labels are rare, and are constructed slightly differently than earlier dolls.